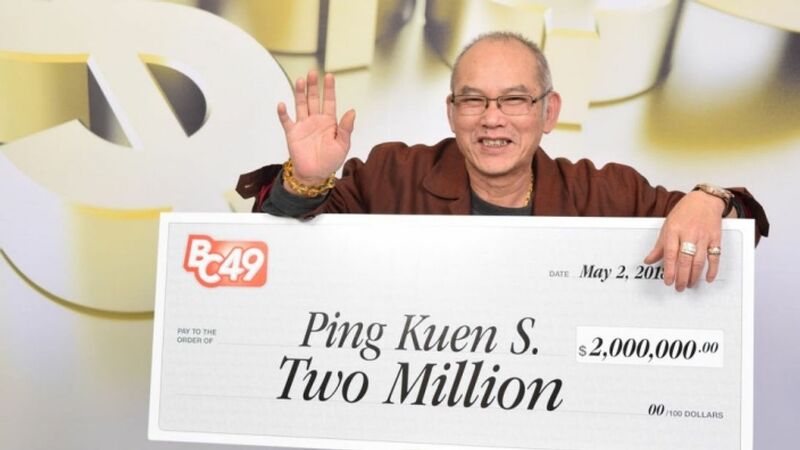 Ping Kuen Shum says he plans to visit China after winning two million Canadian dollars in the BC/49 British Columbia lottery. That's what many will be thinking when they hear about one Canadian man's recent experience. Ping Kuen Shum was celebrating his birthday and retirement when he decided to buy a lottery ticket on April 28. Later that night, his ticket matched all six numbers - netting him the entire C$2m (£1.1m) jackpot. "It’s unbelievable that all three events happened on the same day," said Mr Ping. "I have worked hard for so many years and I’m looking forward to sharing this fortune with my family." The odds of matching all six numbers for the BC/49 lottery are one in 13,983,816. Mr Ping said he celebrated the win with a dim sum meal shared with his family and friends, and now plans to take a trip to China. BC/49 is a British Columbia-only lottery game which costs $1 per ticket. It comes after a claim was made for a £121m EuroMillions jackpot, which was won by a UK ticket holder in April. The lucky winner will be the third biggest lottery winner in UK history.